KIRKUK, Iraq (IPS) – Reminders of the last occupants of camp K1 in the northern Iraqi city of Kirkuk are only visible on the murals at the main gate leading into the compound: Iraqi soldiers saluting the flag, pointing their weapons or being cheered on by grateful families. But Iraq’s 12th Infantry Division fled, leaving everything behind, after the arrival of fighters with the Islamic State of Iraq and Syria (ISIS) in June 2014. 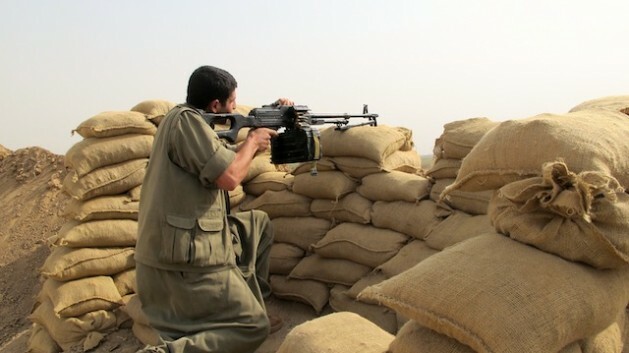 Today, the military garrison hosts a joint Kurdish force of Peshmerga units – Kurdish army soldiers – and guerillas from the Kurdistan Workers’ Party (PKK). The PKK and the Peshmerga fought each other back in the 1990s, but a powerful common enemy – ISIS – brought them together last summer. A visit to the trenches where the united front is still holding back the Jihadi militants offers a glimpse into the region’s complex ethnic and ideological dynamics, as well insight into the relationship between armed groups and the local population. 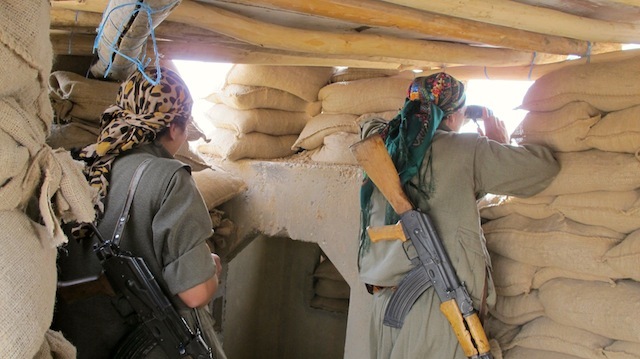 After a brief introduction, Heval Rebar – Kurdish for ‘Comrade Rebar’ – offers to accompany this IPS reporter on a drive south alongside an earthen wall. A chain of checkpoints gives us access to military posts or villages recovered from ISIS, some of which have been completely destroyed by air strikes led by the U.S. and its allies. 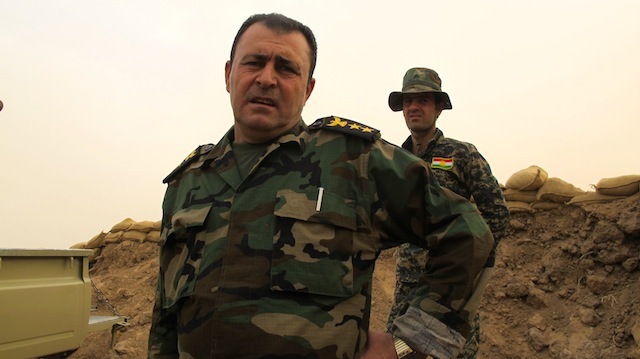 Peshmerga Colonel Jamal Masim Jafar welcomes IPS from inside a bunker standing close to a 15-meter-high promontory, which has its replica every thousand meters along the wall. Jafar talks of “constant” fighting: “We get sniper fire from two houses and a tower the enemy has raised but they also hit us with an improvised device made of gas canisters,” explains the official, adding that the last fire exchange was “just an hour ago”. Despite the hardships, he appears satisfied with his PKK counterparts. “We have a very good relationship with the PKK and we’re fighting together not only for the Kurds, but also because ISIS is the enemy of mankind as a whole,” he stresses. Sitting to his right, Comrade Rebar nods. After the mandatory cup of tea, Jafar invites us to the promontory, which overlooks Al Noor, one of the many villages built by Saddam Hussein – Iraq’s ousted ruler – to host Arab settlers on Kurdish land. Al Noor remains under ISIS control, but last week Kurdish forces launched a major offensive southwest of Kirkuk, taking back nine villages like this one plus a 24-square-km swathe of land. “These gains are only possible thanks to international aid, both supplies and air strikes,” Jafar notes while he walks towards one of the armed pick-up trucks. “We have just installed machine guns on the back of the vehicles. They are French and we got them recently. We are also getting night vision goggles, which are essential in this environment and MILAN guided missiles from Germany. Regarding air cover, we get it every time we need it,” explained the Kurdish officer. He said he had spent seven years with American troops in Iraq, and that he would welcome western foreign troops in the region. Coordination between Kurdish factions is more than evident but that has not been the trend in this part of Iraq over the last decade. Historically claimed by Kurds, Arabs and Turkmen, oil-rich Kirkuk is among the so-called “disputed territories” by Baghdad and the north-western Kurdish city of Erbil, very much one of Iraq’s thorniest issues even years before the emergence and advance of ISIS. Ethnic and sectarian clashes have been rife in this part of the country, with the local population being constantly targeted from every side. Our next stop on our way south is Nouafel, an Arab village next to the wall where PKK fighters keep their positions. From their makeshift headquarters in one of the houses, Comrade Selim prefers not to disclose the exact number of his fighters deployed here. “We have enough to fight ISIS,” he tells IPS, settling the question with a smile. From the little hill where they hold their positions, another fighter, Comrade Farashin uses a pair of binoculars to monitor Wastaniya – the closest village under ISIS control. “In the spring we received a course in urban warfare for two months conducted by two Italian instructors. I learned many things they had not taught me during my training in Qandil [the Kurdish mountain stronghold],” recalls this fighter, a young man in his early 20s hailing from the nearby town of Tuz Khormato, a predominantly Turkmen district located 170 km north of Baghdad. What makes this combat post particularly interesting is not only the fact the village remained under ISIS control for seven months, but also that the majority of the local villagers have not left the area. At the request of Comrade Rebar, a dozen locals agree to meet this IPS reporter in a house just a few metres away from the one occupied by the guerrillas. At first glance, the relationship between civilians and fighters looks cordial. Greetings are exchanged and some of the fighters try a few words in Arabic to break the ice. Meanwhile, our host, Arkan Ali Bader, serves Arabic coffee, which everyone drinks from the same cup. The sound of incoming fire from the other side hardly provokes any visible emotion among the villagers. That’s been part of their daily life for over a year. However, Ali Bader says he regrets that his land, and that of most of the villagers, lies today in “no man’s land” – between the Kurds and ISIS. Also dressed in the traditional lose garments, Juma Hussein Toma claims that during the seven months the village was under Jihadi control, life for ordinary people did not undergo significant changes. “When ISIS came they announced through the mosque’s loudspeakers that they had freed our village from infidels, and that it was the victory of the revolution, but no one here suffered threats of any kind,” explains Toma. “There are a few who left because they had no work here, but not because of the war,” adds the peasant. “ISIS killed a few [people] in Al Noor because they had been members of the Awakening Councils [a US-backed Iraqi militia that fought against Al Qaeda] but none of us was hurt,” stressed Mohamed al Ubeid. Locals in Nouafel said they were happy about the arrival of the PKK fighters. However, such statements were made in the presence of those very fighters, making it impossible to ascertain whether or not they were coerced. After the expected polite farewell, a PKK fighter points to the deep ditch surrounding their headquarters in the village. “We had to dig it because we do not trust the villagers,” he admits, just before returning to his guard shift by the earthen wall.